The old Sony Ericsson warhorse returns for one more campaign. A lot has changed since Sony Ericsson first launched the P series of smartphones 4 years ago. BlackBerry launched its iconic 6200 series handheld before going on to dominate the email smartphone market and Palm bought Handspring and created the Treo line of phones, its most recent launching last month in the guise of the 750v, but still the P series has forged on. 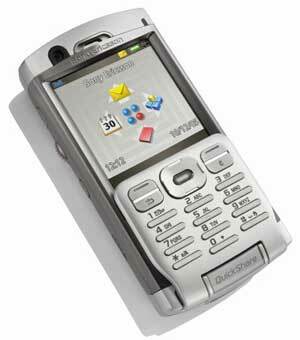 Not keen, it seems, to let the model die out, Sony Ericsson has created the P990i, a 3G variant on the series. The design has kept to its heritage (in our opinion for the worst) which means an incredibly bulky handset (it measures 114 x 57 x 25mm and weighs 150 grams) with a large 262k colour 240 x 320 pixel touchscreen. As first seen on the P800 the main crux of the phone is a flip down keypad that not only turns the screen from regular to touch, but also reveals a small miniature QWERTY keyboard. On the back of the unit Sony Ericsson has added a 2 megapixel camera, and in keeping with its recent styling the phone's design emphasises this rather than trying to hide it. More bulk with the inclusion of a lens cover and the accompanying styling, it seems that at no point has Sony Ericsson pondered that someone might want to put this in their pocket, suit or otherwise. Like the M600i, the P990i is fiddly and we found it took some time to get used to the miniature keyboard and the fact that the jogger wheel and back key, as found on the more business-focused BlackBerry handhelds, is on the other side. This means you have either got to control everything with your index finger, if you are holding in your right hand, or use your left hand if you want to use your thumb. Application-wise and it????? ?s the same story as the M600i with the P990i, powered by the Symbian OS 9.1 all that you could imagine and there are plenty to suit the office user and the software offering is similar to that found on the P900 series albeit a bit on the slow side. Sony Ericsson utilises the phone's 3G connectivity with the inclusion of a fully fledged HTML browser - in this case Opera 8, and having the speed and large touchscreen certainly makes a difference over 2G-enabled devices. Other software included as standard on the phone includes an RSS reader, VPN support for business users, an Adobe PDF viewer and QuickOffice to look at Powerpoint, Word and Excel documents. Where the P990i wins out over the M600i is the inclusion of that camera and although its bulky casing protrudes out the back you do at least get 2 megapixels for your money. You also have the ability to save the images on to the unit's 60MB of internal memory or to the larger Memory Stick Duo or Memory Stick PRO duo rather than the newer M2 card. The second feature is the inclusion of WLAN 802.11b for web surfing when you are in a 3G area but do have access to a wireless network. Like the old Palm Series V PDAs of yesteryear the P990i is stuck in the past, however to some its workhorse like features will no doubt appeal. On paper the P990i ticks all the boxes, however in practice you've got to be a brave man to pull this out of your pocket. Good on features, the P990i design is just starting to show its age.